In Vancouver to discuss his work, Japan’s leading architect, Kengo Kuma, personally revealed plans for his first North American, large-scale residential tower – Alberni by Kuma – proposed for the globally renowned city on Canada’s westcoast. Westbank and Peterson, Canada’s premier developers of luxury, mixed-use projects, have engaged Kengo Kuma, and his firm Kengo Kuma and Associates (KKAA) to design the 43-storey tower near the entrance to Vancouver’s famed Stanley Park. 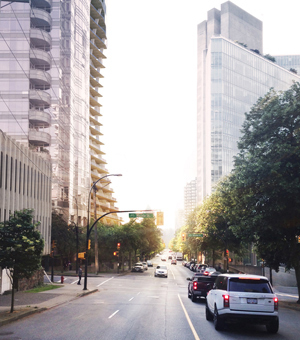 The proposed tower is part of a small collective of internationally influenced designs in the city, under the direction of Westbank and Peterson. The form of the building – a gentle curve – is the most important architecturally; the Japanese garden – a moss garden that surrounds the base of the tower – is the most important spatially. “He is the architect without frontiers,” said Ian Gillespie, Founder & President, Westbank. On April 12th, 1,400 people gathered at the University of British Columbia’s (UBC) Chan Centre for Small to Large, an Evening with Kengo Kuma. Kuma took the audience on his journey from Small to Large, first exploring the small, soulful scale of his early projects transitioning to his larger global projects that still retain the intimate detail of layering and connectivity to location. That includes the Tokyo National Stadium recently awarded to his firm and Alberni by Kuma, the proposed 43-storey residential tower in Vancouver, by Westbank and Peterson. Westbank initiated the architect speaker series, in partnership with UBC - SALA (School of Architecture and Landscape Architecture), to provide an opportunity to discover more about the local projects that are global influencers and spark conversations on how to innovate and shape the future of our cities. It began with Pritzker Prize-winning architect Tadao Ando, followed by Bjarke Ingles, who has designed Westbank’s Vancouver House and most recently, Kengo Kuma. Small to Large: An Evening with Kenga Kuma (FULL EVENT) from westbankcorp on Vimeo.